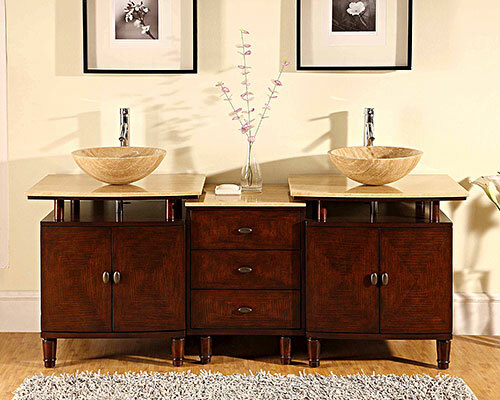 The Valdina Double Vessel Sink Vanity features a stylish use of levels and clean lines, as well as an interesting textured pattern on the drawers and doors. The counter tops and sinks are Roman Vein-Cut Travertine which have been pre-drilled with a single hole for straightforward faucet installation. Each cabinet has double doors with shelving for organization. 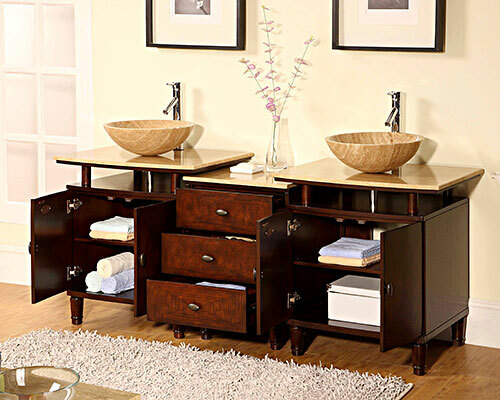 The central drawer bank provides three drawers for more storage. The legs and spacing between the cabinet and counter top give an open, contemporary atmosphere.